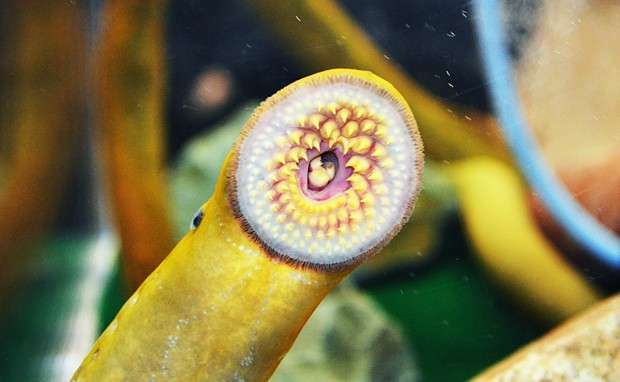 Of all the fishy predators in the Great Lakes, few are more destructive than the sea lamprey. There's something of a horror movie in their approach: jawless, they attach to prey such as salmon, whitefish or trout with a sucker mouth and drain the victim of its blood and lymph. For years, scientists and policy-makers have been trying to devise strategies to curb this population, which first arrived from Europe through shipping channels in the early 20th century. Now, in a collaborative project with Istvan Imre of Algoma University and Nicholas Johnson of the United States Geological Survey, Concordia biology professor Grant Brown has developed a promising—and natural—solution. Their findings, which focus on the species' own alarm cues, were recently published in Fisheries Management and Ecology. "Lamprey cause estimates of millions of dollars of damage in lost commercial and recreational fisheries," says Brown, whose work in the Faculty of Arts and Science focuses on aquatic behavioural and chemical ecology. "And since they've been introduced into the Great Lakes, they've also caused huge ecological problems." An effective solution is all the more pressing, given the limitations of current approaches. A chemical lampricide, intended to kill the predator at its larval stage without harming other fish, is very labour- and cost-intensive and poses potential harm to the watershed. A slightly more eco-friendly solution is a low-barrier concrete dam that takes advantage of the lamprey's inability to jump upstream. But this also prevents some salmon and trout from getting through, and deters minnows and other swimmers. What about a chemical barrier? The researchers have found a substance that could be a successful deterrent. Unfortunately for the sea lamprey, it actually comes from inside the invader itself. Like many fish, upon injury, the lamprey release a compound into the water with a smell that warns others in their species that danger is near. After identifying and confirming these cues under lab conditions, Brown and his colleagues investigated whether they were an effective deterrent in the real-world setting. In an intensive project, they tagged hundreds of sea lamprey with passive transponder tags and then found a testing ground. "By applying these naturally occurring alarm cues to the tributary stream just above the mouth of the main stream, we wanted to determine if we could prevent migrating sea lamprey from going up into that stream. In other words, could we make a chemical barrier to stop the lamprey?" In control tests, over 60 per cent of tagged lamprey swam up the main stream and around 25 per cent went up the tributary stream. But when they employed the alarm cue barrier, fewer lamprey swam upstream (less than 40 per cent) and 2 lamprey (3 per cent of tagged fish) entered the tributary. The group repeated the study with some variations and found the same dramatic difference. Brown notes that the findings are even more exciting when coupled with research by scientists at Michigan State University, who are working on pheromone cues to attract the species. "So we can set up traps in streams, and by using these mating pheromones to attract adults combined with the alarm cues to prevent them from going up tributary streams, we can push them away from areas we don't want them, and pull them into areas where we do." Additional future directions that Brown would like to take with the study include experiments with a synthetic compound, with the goal being to manufacture it on a larger scale. He also wants to look at different stages in the lamprey's cycle, and even test out the successful approach on other invasive species such as the round goby and Asian carp. Are standing bikes a healthy option for everyone?